I fully expect this to be a hoax but am intrigued by the possibility that it might not be. 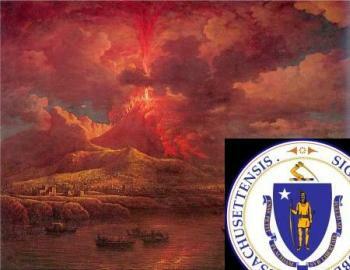 Just think: there might be a connection between the painting displayed on this page, “Vesuvius Erupting at Night,” and the Algonquin Native American on the seal of the US State of Massachusetts. (I don’t mean that there is an Algonquin gentleman straddling the one carnivorous, aquatic mammal of the family Phocidae owned by the great state of Massachusetts; I mean that the gentleman is depicted on the emblematic design that represents that state. There. Just so you don’t think this is too ridiculous.) How could this be? I haven’t the slightest idea. First, the painting is by the English painter, William Marlow (1740-1813). He was a popular and respected landscape artist who specialized in subjects taken from the so-called Grand Tour, among which were a number of paintings of Italy, particularly scenery and ruins that would appeal to the Grand Tourists of his day. Vesuvius erupting certainly fits in that category. The painting is from 1768; there were two verifiably large eruptions of Vesuvius in the 1700s—1737 and 1794, so there may be some poetic license in the fireworks, but that’s fine. That’s what artists do; people are more likely to buy a painting of a volcano erupting than not erupting. Marlow retired in the 1780s, but financial difficulties prompted him to publish Etched Views in Italy in 1795, a collection of six etchings he made from his own earlier water-colors and oils. His work includes a number of scenes in Naples besides the one of Vesuvius shown here. So far, so good. Now, the biography of Marlow in the authoritative Grove Art Online also contains this: “He is also thought to have designed the seals for the original 13 United States of America.” That’s all it says. No source, no citation. We warn college students against “they say” statements like that without backing them up. That is, if I read that Mozart wrote Dixie, I want some proof. On the surface, the Grove sentence means that —besides the Alonguin gentleman mentioned— there were 12 other seals that Marlow purportedly had something to do with. The possibilities are, if not endless, at least many: ships, plows, sheaves of wheat, olive branches and eagles—and that's just Pennsylvania. You can do the rest, yourselves, but there are published accounts of how most of these emblems were designed or chosen, and none of them mention the English painter. So, doesn’t this sound like one of those bits of vandalism that college-kids with too much time sneak into Wikipedia articles? Except that this is Grove. The Grove, as they say. I have written a pompous letter to the editors and am awaiting a reply. I’ll let you know. I really want it to be true. I am vindicated but disappointed. A very nice lady, Jane, an editor at Grove agreed with me and said they would delete that passage in time for the next on-line edition of the Grove Art Online. Sigh. Too bad. What a story. In fact, the reference to Marlow having designed seals for the original states derives from an obituary notice of 1813 of which the British Museum Department of Prints and Drawings has a copy, aggravatingly without its original source noted (W.T. Whitley papers). However, it is genuine, but wrong. Nonetheless, there is an intriguing drawing by Marlow for a seal for Florida, done around 1763-64, when I believe Florida was (briefly?) British following the capture of Havanna from the Spanish during the Seven Years' War. Around then Marlow painted three or four pictures of Havanna [sic], probably based on drawings made by naval officers who had taken part in the campaign and contemporary accounts. He did not, so far as anyone knows, go anywhere near the place himself, but pictures of the kind were not infrequently produced by artists in England working vicariously from sketches and descriptions. Two of his Havanna subjects are in the National Museum in Havanna. The Florida seal drawing was probably seen by the writer of the 1813 obituary, whom I suspect was his only recorded pupil John Curtis, the son of a Twickenham family with whom Marlow lived. I saw the drawing when a large collection of Marlow material appeared on the market with Christie's in the 1990s. It may well be the case that whoever wrote the 1813 obituary made an imaginative assumption. Marlow was in Italy 1765-66 (not 1765-68 as is usually supposed), and during that visit seems to have made the acquaintance of William Hamilton. He then exhibited a 'Vesuvius Erupting' in London (Society of Artists) 1768, well before Joseph Wright: he was undoubtedly influenced by seeing pictures by Claude-Joseph Vernet from which he derived aspects of the treatment in the Berger Collection, Denver, picture you reproduce. That painting had been attributed to Wright of Derby when it was acquired by Paul Mellon, but was not included in the catalogue of his work by Benedict Nicolson. I reattributed it to Marlow as its style and composition were clearly his.